A blog post by assistant director Deborah Cardin. On Wednesday, I traveled to Patterson Mill Middle School in Harford County to facilitate educational activities for 100+ 6th graders over the course of the day. The activity that the teacher selected was our Lives Lost, Lives Found photography exploration unit that was developed several years ago when we had an exhibit of the same name on display. The exhibit explored the experiences of the 3,000 German Jewish refugees who found safe haven in Baltimore in the 1930s and 40s. The exhibit provided wonderful educational opportunities to teach students of all backgrounds about the Holocaust from a different perspective, using first-hand testimony and artifacts from individuals who left Germany during an intense period of upheaval and discrimination. Personal belongings of Herta Baitch who left Austria for Baltimore in the 1930s as an unaccompanied child participating in the German Jewish Children’s Aid Society’s rescue of Jewish children. 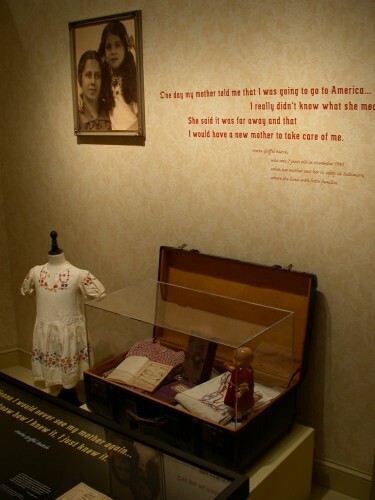 In addition to examining conditions in Germany that led to the large-scale migration of Jews and the difficulty that Jews encountered in their attempts to leave, the exhibit also explored the challenges that the refugees faced in adapting to life in their new homeland. and then learn the story of the Weil family. As we discuss this photo, students who have earlier questioned why Jews didn’t simply leave once the Nazis came to power realize just how complex this question is. The Weils had deep roots in Germany; Theo Weil was a decorated army officer in the German army during World War I and was a successful businessman. 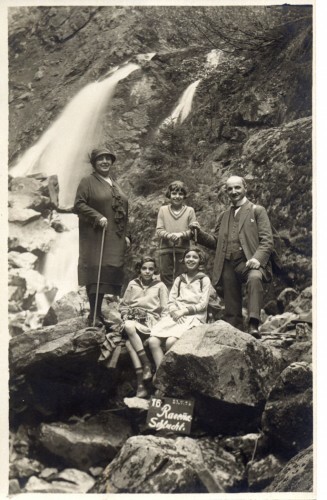 Like many other Jews living in Germany, the Weils felt more German than Jewish and were reluctant to uproot their family for what they thought would be a temporary political situation. However, it soon became apparent that their situation was not going to improve. This point was further proven by Theo Weil’s arrest in the wake of Kristallnacht. Theo’s wife, Hilda, arranged for Theo’s release from Dachau by selling family possessions and paying a bribe to the prison officials. 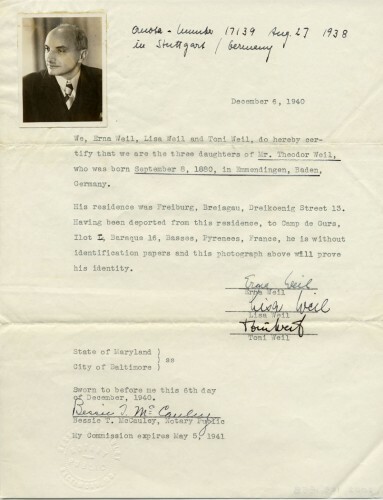 As we discuss the Weil Family’s plight, students also become aware of just how difficult it was for Jews to leave Germany because of the strict immigration quotas that many countries – including the US – had established. The Weils had applied for visas prior to Kristallnacht which was fortunate as the wait for visas became extraordinary afterwards. They still were forced to endure a lengthy wait as the US limited German and Austrian immigrants to 27,370 immigrants per year. While awaiting their US visas, the Weil daughters had an opportunity to travel to England where they worked as household servants. While living in England, they received their US visas in April 1940. After arriving in the US, they settled in Baltimore and immediately found jobs and worked hard to establish new lives for themselves. They also worked to help their parents emigrate from Germany. They were soon devastated to learn that their parents were sent to Gurs, an internment camp in France. The three daughters worked strenuously to secure their parents release. Because their parents had been approved to receive US visas, they were able to appeal to the US State Department for assistance. Because Theo and Hilda Weil had no identifying documents with them when they were deported to Gurs, their daughters had papers drawn up for them. Amazingly their work was successful and their parents were released from Gurs and reunited with them in Baltimore in April 1941. 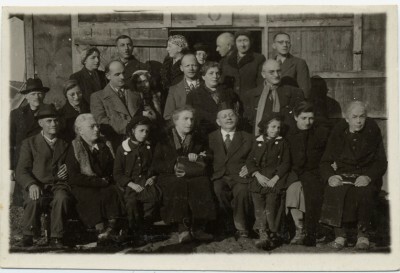 The photograph of the Weil family is the first one in the series of photos in the timeline and it inspires such interesting discussion about the rich lives that Jews led in Europe prior to the Holocaust, the struggles they encountered in their attempts to leave, and the hard work that refugees encountered in settling into their new lives while awaiting news of relatives left behind in Europe. After working with five separate classes and having such positive interactions with the students and teachers at Patterson Mills Middle School, I left feeling energized about the impact that JMM programs have on students and how our resources inspire them to think about topics they are studying in school in new ways.